“(1) to take charge of a (museum) or organize (an art exhibit). The word that comes to mind when I think of what I have been doing on Twitter and my blog is the above: curate. I know, I know. You might be thinking, what are you talking about Hanna? The word curate comes to mind when looking at Twitter as I have been “sifting through” my Twitter feed on a daily basis in order to “select” articles that I find engaging and would like to present and comment on for my followers. I can’t argue to be a curator in the traditional, art museum sense (because I am not). However, I think the word curate, and the process of curating will provide a helpful frame for this discussion. Using the hashtag #smpasocial, I have been thinking about content that may be meaningful to both my fellow classmates and people who follow me for other reasons. I know. I know. Twitter isn’t an art exhibition? Not exactly, no. But there are elements that have to be combined in order to create a compelling Tweet in order to engage with the audience. Some people may argue that the term curate should be reserved for those who have been trained in the speciality. As mentioned above, I still believe this is an interesting term to consider and helps me to think about the selection of content from throughout the web. Alex Williams wrote a nice piece about the evolution of the word curate for The New York Times, and how some people like the way the term is being used while other’s don’t. The article is from 2009, but it is still very relevant. When I thought about Tweeting, I often considered two things when it came to the content: I liked to combine digital and social media innovations or trends with….you guessed it, museums! From “The New Emma Jones Society” Blog. Above, you will find one of my favorite pieces designed by Twitter artist, Hanna Cunningham on October 30, 2016. (1) As we discussed in our Twitter workshop on October 31, mentions are very important for tweets. Not only are you ensuring that someone will actually see this tweet, you also have the ability to give a nice shout out or start a conversation. This article mentioned multiple museums, so I had many options of who I could tag. I chose the Art Institute of Chicago (@artinstiutechi) as it has is a museum I have visited often being from the area, and I felt like it gave it a more personal touch. (2) I was gracious and congratulatory in my post (both descriptors we discussed in our Twitter workshop on October 31). I used positive, upbeat language- I said “I love this” when referring to the article mentioning the Art Institute. I explained why I liked the article, while also going beyond what is said in the quoted tweet itself, therefore providing maximum information. As we discussed in our Twitter workshop on October 31, it is important be polite and also tell people when you like their work. (3) Some of my twitter audience is specifically interested in museums– I knew there were people following me who would be interested in museum related content. Also more and more people want to take photos, Instagrams and selfies with museum art. From Kerry Flynn’s Huffington Post article “Somebody Made a Bunch of Museum Paintings Look Like They’re Taking Selfies”. This one was captioned as being at the Rijksmuseum in Amsterdam. (4) By using the class hashtag and providing a new social media phenomenon that we had not discussed, I was making the content more sharable. (5) The tweet that I quoted has a nice little photo featuring Los Angeles County Museum of Art. The photo gets my audience a little more interested in what I am talking about. (6) The quoted tweet refers to using snapchat and popsongs- sounds kind of trendy, which helps to make the content more trendy and sharable. In the Snapchat workshop (on October 5 with Lauren Glickman) we discussed how Snapchat is a newer trend that more and more organizations are playing with and trying to see how these quick photos can be useful. However, you also have to be strategic with your use of Snapchat as Los Angeles County Museum does, as discussed in the quoted article, “Museums, the New Social Media Darlings,” by Kerry Hannon. Here we have a beauteous tweet that displays the complexities of Wikipedia created with tempera paint and Twitter typing power. (1) Similar to the tweet above, mentions are always great (and often helps with likes). Chris Alcantara wrote a very in-depth piece on all the editing that went into Wikipedia including the two candidates pages. I thought it was a great piece, so I mentioned him in the tweet. “Yes! Great piece”. Who doesn’t want to receive a complement? (3) We discussed Wikipedia and collective publishing, two subjects we had discussed in class. This makes the content a little more spreadable. Wikipedia is fascinating. Andrew Lih discusses the desire for more information and a way to bring many sources together in The Wikipedia Revolution. He writes, “Wikipedia became an instant phenomenon because of both supply and demand. In an information age with a sprawling labryinth of information sources, balance and reliable content is a rare commodity, in high demand”(Lih 5). (4) Current news– I know most people who follow me on Twitter are following the news and were very engaged with all of the content coming out of the election (cue the sighs), so I knew this would be an appealing topic for many followers. Current news relates to Henry Jenkins’s point about how content that has timeliness is something that is easy to spread. Henry Jenkins writes, “Often, a media text spread particularly far when it depicts a controversy a community cares about at the precise time it is looking for content which might act as its rallying cry”(Jenkins 215). Everyone was very concerned about the election at this time. I like this tweet..but let’s just say this piece is in the “non finito style”. It’s good…but not quite there. (1) I bring up points from the article that are similar to the ones we have thought about: “smart design”, “memes”, and content that is “engaging” is all definitely easy to share. The article that I shared here by Elizabeth Segran compares the site Bustle to the visitor experience of a social networking site or blog. I also learned that the tone of Bustle was very important to it’s success (similar to how we have talked about figuring out an appropriate tone for our blogs). Elizabeth Segran describes similarities between Bustle and Tumblr or Medium. (2) It’s about media– new, different media. A lot of people following me are interested in journalism, innovations in journalism and new sites. Bustle is still a relatively new and developing company, so I knew this article was good to share and would peak the audience’s interest. (3) I expanded on what was said in the quoted tweet– again, I provide more context when I quoted the tweet, helping to give the audience a better sense of what was going on in the article. (4) I specifically mentioned a company that is using spreadable content. We are talking about memes here, which are meant to be humorous and use references, two items that Jenkins discusses. Jenkins writes, “Humor is not simply a matter of taste: it is a vehicle by which people articulate and validate their relationships with those with whom they share the joke” (Jenkins 204). In a way humor also seems to open up a relationship with the reader. (1) I could have mentioned someone (e.g. founders of Bustle, main Bustle account). (2) Could have tried to work in an example of engaging content to add even more context. What’s good about this tweet? (1) Yay- a mention! I tagged the organization/ media outlet (@Refinery29) that is mentioned in the article by Suzanna Heldring. This leads to the possibility of higher engagement and I am also giving a shout-out. (2) I make an observation that adds to what is already said in the quoted tweet- I have noted that these rooms/presentation works well on Instagram. (3) What did I learn? Instagram has impacted real life- organizations are designing spaces that they know people will not be able to resist taking a picture of and will end up on social media. Curation is everywhere! Below is a photo from the 29 rooms installation that could have added a lot of fun to the post. One of the 29 rooms referenced in the tweet above. (Photo in Bushwick Daily). (1) I tied the Tweet into a subject I know many of my followers are interested in- museums- while also connecting it back to web culture and accessibility surrounding the web that we have discussed in #smpasocial. (2) Nice little photo of The Met in quoted tweet– photos always help in digital communications. (3) We have discussed the arguments surrounding whether the web has helped to provide more information for more people through a variety of mechanisms. Boyd and Ellison describe the rise of the blog, for example: “For example, the structural foundations of blogging were first created during the dot com bubble with services like LiveJournal and Blogger, both founded in 1999. Still, blogging started rising out of post-crash ashes circa 2003, and in 2004, the US Presidential election took blogging mainstream and news agencies began critiquing the role that ‘web diarists’ could play as amateur journalists (Lee 2004)”(Boyd and Ellison 161). We see hear that organizations such as museums are taking these technologies, and even more advanced technologies than described by Boyd and Ellison above, to make educational materials and collection items increasingly accessible to the public. (4) Museums are trying to educate people about art in many different ways. Back to curation! Yay! Through my blog I have been curating (in a sense) by selecting exhibitions to review that I think will resonate with my audience. I love working on this blog. I love tweaking with the format. I love trying to get a picture just the right size, and I loved figuring out the right code to get the Twitter list embedded into the “Museum News” section of my blog. (score). The digital design element combined with the writing is an area I really enjoy working with. One challenge I had was determining how to produce content that was really informative and packed with information about the exhibition I was reviewing while still being digestable for those who are interested in museums and also those people who might not be interested in museums. Another way of putting that would be it was sometimes a challenge to think about how to make very spreadable posts. One strategy I used was trying to highlight the best photos I had taken from the exhibition. Often, these photos would also help me to guide the main theme and points I included in the post itself. It could be hard to try to be authoritative while also trying to speak to audiences that were coming with different knowledge levels surrounding museums. For example, how does one make a post about museum architecture sharable? Well, I tried to include the best photos I had and could find, and I put it in list format to make it a little easier to read. I loved taking the photos for this blog as photography is a skill I have been trying to work on over the past several months. I also always felt very pleased whenever I found an article that I could link to that would provide the blog with more context and information. Part of the reason I loved this blog post, “Musing on the Modern”, and loved working on it was how visually appealing I found the whole piece to be (gotta love the Washington Color School). I was so excited to have a good excuse to go see the newly renovated National Gallery of Art’s East Wing (sight, love that place). I love talking about modern art because it is usually very bright and uplifting, and the process behind it is usually somewhat fascinating. Me at the National Gallery of Art’s East Wing. Yay stripes, yay color, yay newly renovated museum. Photo by friendly fellow museum goer who’s name I don’t know. On top of that, I was happy to include a video with the post. It was great to include an awesome article that provided a little more background on the Washington Color School. I always really enjoy searching for these articles. And the video for your enjoyment. It is not technically amazing, there is some sound I would cut out next time. But I love the Rothko room and I liked being able to provide a different perspective than just a photo. I would definitely like to work on creating more compelling videos that are short like this one. I think this video provides a good starting point. I really enjoyed Rachel’s blog post where she narrated her experience going to a Harry Potter trivia night. Her writing set the scene and made me feel like I was at this event with her. Her voice came through and it made the blog stand out– it wasn’t like I was reading any other typical blog. On top of that, her use of photos and links added superb context. The video at the end was the cherry on top. It just felt like very heartwarming and nostalgic post. On top of that, I totally related to her enthusiasm surrounding Harry Potter and how much she enjoyed being a part of that crowd. Rachel is very detail oriented in her posts, and includes bits that really help to make the story come alive. One element of her post that I especially liked was her list of all the other trivia team names (shown below). Everyone can relate to the fun that comes with trivia (and often Harry Potter). Rachel did a great job summing it up while also adding her own personality into the piece. This post was genius. I was very intrigued by Talia’s blog, “Intellectual Property vs. 2016” right from the start as I had never really had a huge interest in trademarks or patents…but she made it so very spreadable and so very engaging. I liked this post because I learned about a current issue, but there was also a little bit of humor mixed in. Even just the way she writes at the beginning, “For more than six years, Nestlé has been on a trademark rampage.Yes, you read that correctly.” And on top of that, who doesn’t want to read about chocolate? Talia has done a great job explaining these complex issues while also making them very intriguing and making the content very clickable. I always learned something new when coming to Talia’s blog which is one of the the aspects I liked the most. I think the combination of education on a somewhat complex topic combined with a smart approach really helped to make this blog stand out. So that’s it. I will be continuing this blog in the coming weeks, so be sure to check back soon as I continue to check out all the exciting museum exhibitions to come in 2017. For some of the ones I am most looking forward to checking out, take a look at this blog post. 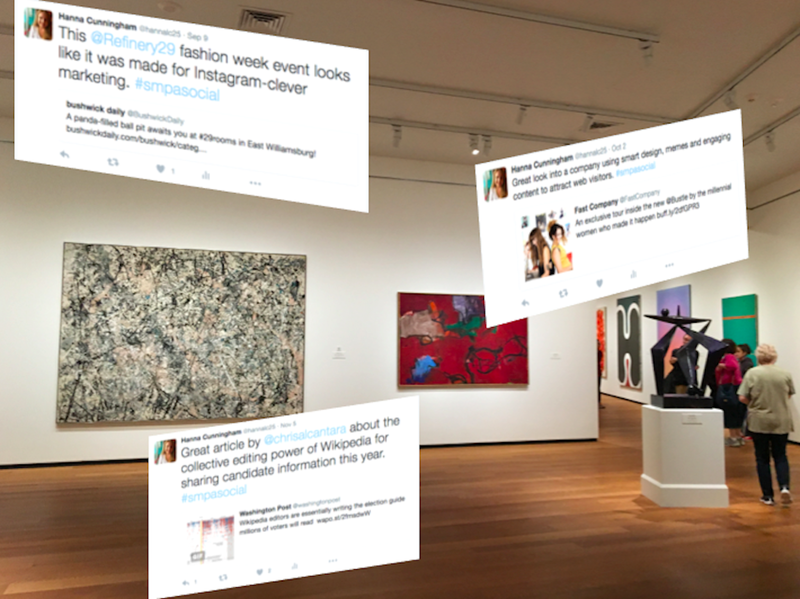 Photo at very top of post created by Hanna with Tweets layered over image of The National Gallery of Art’s East Wing space (taken by Hanna).